Open the Book is a three year cycle of telling Bible stories to children. The first year covers most of the familiar stories in both the Old testament and the New Testament; the second year covers the life of Jesus in more detail and the stories he told; and the last year covers the stories of heroes and heroines (people who have made a difference in history) in the Bible. 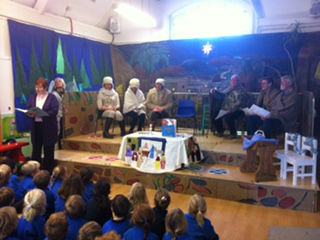 At present Rev'd Jane and a team from St Mary's Church visit St Mary's infant school and Edgeborough School to give 'Open the Book' assemblies. 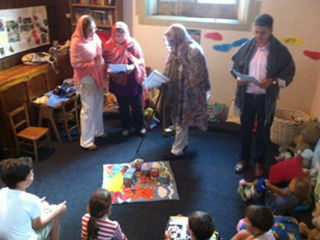 We are hoping to visit Morehouse school in the future with age adapted reflections and prayers. During the 'Open the Book' assemblies an introduction to the story is given, the story is acted out by 'Thespians from the church(! )', then there is a period of quiet reflection followed by a prayer and the Lord's prayer. Often a song is sung which links with the theme for that session. 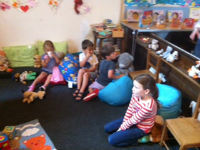 The children engage with and really enjoy 'Open the Book', as do the teachers and those who take part! They always look forward to our visits and often recognise our actors around Frensham and Farnham. One child commented that he saw 'God' (our churchwarden Richard) in Sainsbury's!